An Eternal Cycle: Paradise and Purgatory at London’s Mokspace features the work of Korean artists Park Seo Young and Lyoo Song Nyeo who paint in the style of devotional paintings still found in the Buddhist temples of Korea and other countries, writes SAJID RIZVI. The work of Lyoo Song Nyeo and Park Seo Young at their 2011 joint exhibition. Photo: Mokspace Gallery. The exhibition (14 October-10 November 2011) refers to an almost universal notion that death remains, for most part, a mystery to all living beings before they meet it. 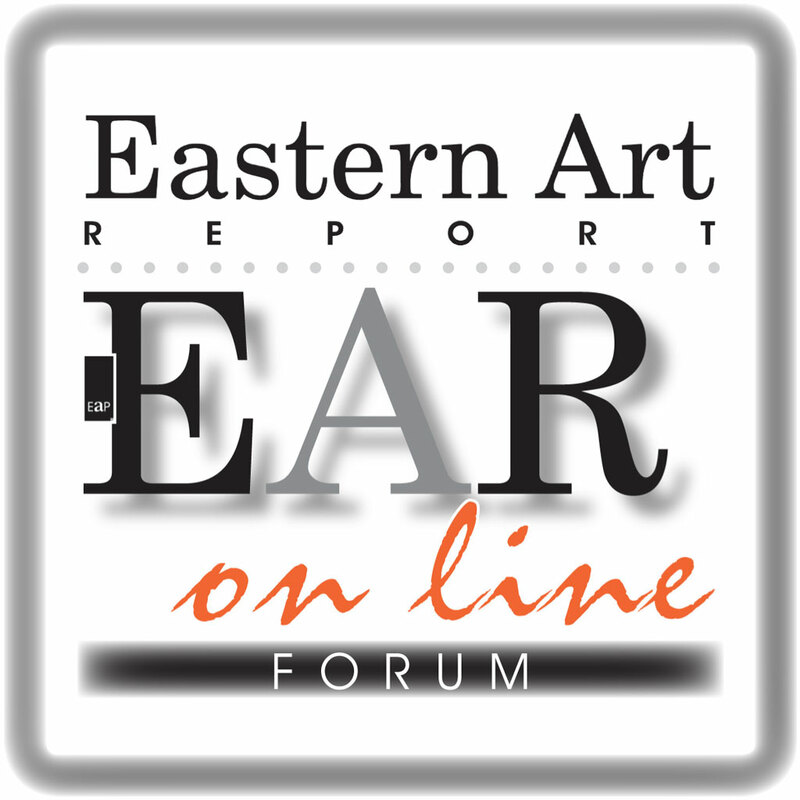 Traditional Buddhist art and words have dealt with issues to do with death in different ways and contemporary artists who embrace and seek to reinterpret the tradition tend to follow the same path. In Buddhism, death is not just inevitable but indispensable for rebirth. The iconography of traditional Buddhist paintings as well as modern renditions is accessible and colourful. Korean interpretations of Buddhism may sometimes seem forbidding and incomprehensible, if only because of unfamiliar terminologies, but the images depict familiar themes refreshed by new interpretations, innovative palettes and ways of looking and showing. 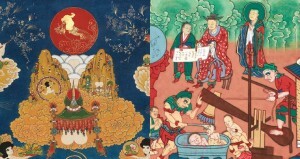 For instance, included in the show are paintings that depict Yomna (염라대왕), and the other nine kings of Hell who judge whether people go to Paradise or Purgatory. This is of course a reference to Yama (Sanskrit: यम), the Buddhist dharmapala and judge of the dead, who presides over the Buddhist Narakas (Pāli: निरय Nirayas) ‘Hells’ or ‘Purgatories. The Buddhist Yama is ultimately based on the god Yama of the (Hindu) Vedas, but similarities begin to elude us as we move away from the origins of the faith. Different interpretations abound in East and Northeast Asia, and those in China, Japan and Korea are but just a few of the many. 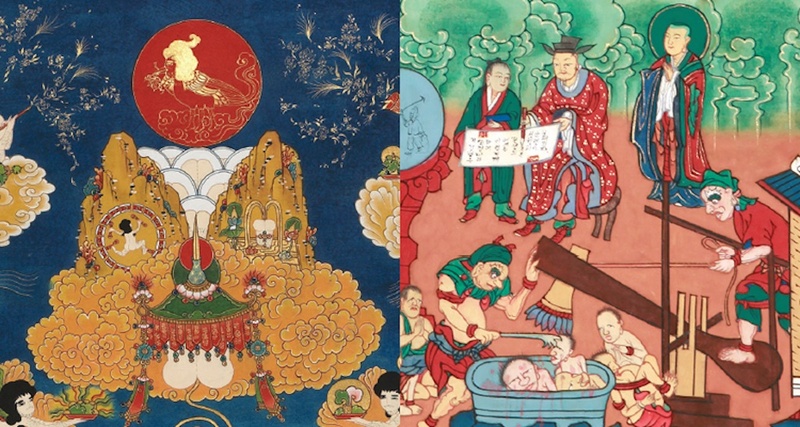 Paintings in this exhibition offer separately the views of Heaven and Hell, those indicative of the various Buddhist hells consigned to the gallery’s basement. Seoyoung Park offers a faithful rendition of a traditional Buddhist Hell painted during the Joseon Dynasty and Songnyeo Lyoo offers us a contemporary view of a Buddhist Paradise. An Eternal Cycle: Paradise and Purgatory. Mokspace. 33, Museum Street, London WC1A 1LH. T +44 (0)20 7637 8880.